Long lasting peace of mind. Warranty applies to equipment manufactured after January 1, 2018. When a product is truly built to exacting standards of quality and durability, the manufacturer’s confidence is reflected in its warranty. Frigidaire heating and cooling products offer one of the best warranties in the business. Product registration is required for maximum warranty coverage. 10 years on all parts when product is registered. See warranty details for more information. If the heat exchanger or the compressor fails within the first 10 years (when registered), or 1 year (not registered) we’ll replace the product with like product under the Frigidaire Quality Pledge program. Not all products qualify. When you install and register your new Frigidaire air handler or coil with your new Frigidaire system, we will also extend the accessory warranty to the 10-Year Limited Parts Warranty. 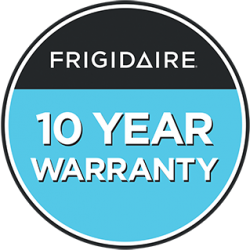 When you install and register any of our Frigidaire Indoor Air Quality or Zoning with your new Frigidaire system, we will also extend the warranty to the 10-Year Limited Parts Warranty. When you register your new Frigidaire furnace or gas/electric packaged system, we will also extend the heat exchanger warranty from 20 years to the limited lifetime heat exchanger warranty. While Frigidaire warranty covers parts, the cost of labor charged by your dealer for service and repair is not. However, extended labor protection plans are available to cover labor costs associated with repairs. Your dealer may offer various coverage plans; we recommend you look for the Contractors’ Preferred Protection Plan brand approved for Frigidaire. What is the difference between the product warranty and extended warranties? A product warranty is the manufacturer coverage shipped with the product. That warranty term is stated within the product and may require registration to fulfill the length of the term. Extended coverage includes plans that are purchased by the consumer, or by the dealer and embedded in the sale of the product to cover additional expenses such as labor, or extending the term of parts not covered by the manufacturer’s warranty. Who do I call when I have a product repair covered under the product warranty? All product warranty calls should start with your original installing dealer. If they are not available, you can search for another dealer by using the Frigidaire dealer locator. The dealer will file the claim on your behalf to get the replacement parts needed. Only a licensed contractor should service or repair your system. We cannot ship replacement parts to a consumer, and self-repair will void your warranty. I am not sure if my unit is covered by warranty. How can I check coverage? If you purchased your product after April 2, 2007, then your warranty coverage is 5 Year Limited Parts. However, if the product was registered within 60 days of purchase, or if you live in Quebec or California, your warranty coverage is 10 Years Limited Parts from date of installation. To check registration, locate the serial number from your Frigidaire air conditioner, heat pump or gas furnace. Click “Register Your Warranty,” and enter your serial number in the top right hand corner. If registered, you may download your warranty documents. If you purchased your unit prior to April 2, 2007. Please call 1-800-422-4328 to confirm your warranty coverage. Warranty coverage outlined in the previous paragraph assumes that all other warranty requirements are met, such as appropriate installation and application of the product as well as routine maintenance. Proof of purchase may be required and/or proof of maintenance to verify coverage term. What do I need for proof of warranty? If not a registered warranty, then please gather the following so we can verify the correct warranty length. Product serial number for the entire system, including outdoor and indoor products. Proof of system purchase from installing contractor for verification. If new construction property, a home occupancy record may be required. I registered my Frigidaire warranty so why do I need to provide proof of warranty? Error with the original serial number registered for warranty. Missing or non-matching components in warranty record. Significant discrepancy between time of registration period and actual product shipped date. As a manufacturer, we are committed to providing quality, problem-free products. However, in the event of a component defect, our warranty will cover the replacement part. If there is a failure of a major component as defined in the terms and conditions of the Frigidaire Quality Pledge (see warranty for exact terms), we will replace the entire unit. Replacement unit and parts must be installed by a licensed contractor. We cannot provide replacement components or product directly to homeowners. Heating and cooling products are sensitive to the quality of the original installation as well as the environment. Product failures due to improper installation, mismatched systems and environmental hazards are not considered a manufacturer defect and not covered by warranty. Contractors, including those listed on our site, are independent contractors and workmanship is the sole responsibility of the installing contractor. Listed contractors are not authorized by, certified by, or agents of Frigidaire Heating and Cooling products. Please refer to our article on how to choose a contractor. Refer to your warranty for limitation details such as environmental hazards that impact warranty. Is labor covered on my warranty? Labor is NOT part of the Frigidaire product warranty coverage that ships with Frigidaire products. If you purchased labor protection, or your dealer included labor coverage with your original Frigidaire purchase, then you are likely covered, but it is always best to refer to the terms and conditions of that specific agreement. If the Frigidaire product is found to qualify under our Quality Pledge replacement guarantee, then we will pay up to $250 to the contractor for labor associated with the installation of the replacement. All other labor charges from the contractor, including servicing, repairing or replacing a part, are not covered by the manufacturer warranty. My unit was not registered within the allotted time period; can I still get extended coverage? Contractors’ Preferred Protection Plans can be purchased to extend coverage if the unit installation was not registered. However, the unit installation must be less than 5 years and a technical inspection and proof of maintenance is required. Contact your Frigidaire dealer for information on extended coverage for an existing Frigidaire heating or cooling product. I have a Watchdog extended warranty protection for Frigidaire. How do I file a claim? The first step is to contact the original dealer who sold you the system and the extended coverage. If the coverage is valid, the dealer will file the claim to be reimbursed through the extended warranty provider’s claim process. If covered, the consumer should NOT be asked to pay the dealer upfront nor should the consumer be referred to the coverage provider to collect a reimbursement. If you are unable to reach the original dealer, please call 1-800-422-4328 for consumer assistance. I have a Contractors’ Preferred extended parts and/or labor warranty protection for Frigidaire. How do I file a claim? The first step is to contact the original dealer who sold you the system and the extended coverage. If the coverage is valid, the dealer will file the claim to be reimbursed through the warranty provider’s claim process. If covered, the consumer should NOT be asked to pay the dealer upfront nor should the consumer be referred to the coverage provider to collect a reimbursement. If you are unable to reach the contractor, please refer to your original plan documentation and call Contractors’ Preferred Protection Plan customer service at 1-866-845-4718 for assistance.